You’ve seen the grass down at the cricket ground, how does old Fred get those immaculate stripes and squares? And then there are the greens at the golf club and the bowling green. Your lawn is a long way from such perfection. Well, they’re looked after by professionals, you might say, and unless you bring someone in to wave a magic wand your patch will remain just like any old lawn. It needn’t be. Consider what your lawn is used for and the look you want. If you’re after that perfect ornamental lawn then you may indeed need some help from a professional lawn care company who make regular visits and treat the lawn. It also depends on the type of grass your lawn consists of. Ornamental lawns comprise dwarf, fine leaf varieties while strong, tough broad leaf types are better for areas used for play. 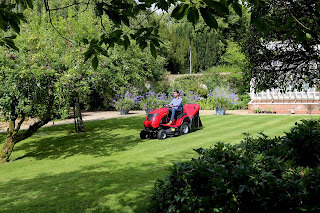 If you do have an ornamental lawn you’re more likely to be using a cylinder mower with a summer cut height of 5mm-10mm and mowing every two or three days (depending on growth). For most of us the lawn type will be for leisure with a summer cut height of 15-20mm and cut every three or four days. Utility grass will be cut to 25mm in summer and mown every six or seven days. Top dressing on high maintenance, ornamental lawns at this time, using a suitable top-soil, will help maintain a smooth surface. Removing clippings gives a clean finish, especially if your machine has a roller then collecting is essential to lay down a good stripe. It also removes weed seeds and discourages worms and helps reduce the incidence of disease. Returning clippings (mulch cutting) encourages worm activity and the grass will keep better summer and winter colour and it reduces the need to fertilise. It can, however, encourage the incidence of disease and is best done in times of drought to help protect the lawn from the sun. Watering when required should be infrequent but heavy – light watering encourages poor root growth. If your lawn is large enough to mow in different directions it should be carried out each time you cut because mowing in one direction only will cause ‘nap’ which is where the grass grows flat, encouraging thatch and making it more difficult to stripe. You’re on your way to greener grass.